Vacuum-controlled tuning 24mm Carburettor of Naraku. The aperture of 24mm allows a much larger gas throughput and is associated with a greater intake with more power. The size of this carburettor should be used only from the 85cc [51mm] cylinders with correspondingly large cylinder heads upwards. The carburettor is equipped with an electric choke and # 102 Main jet. The carburettor is tailored for 51mm cylinder kits from Naraku. The air filter connector is 42mm. The original throttle cable can be used, it may have to be shortened at the carburettor side, at the cable housing. The carburettor was deliberately not equipped with accelerator pump to prevent over-fuelling of engines. 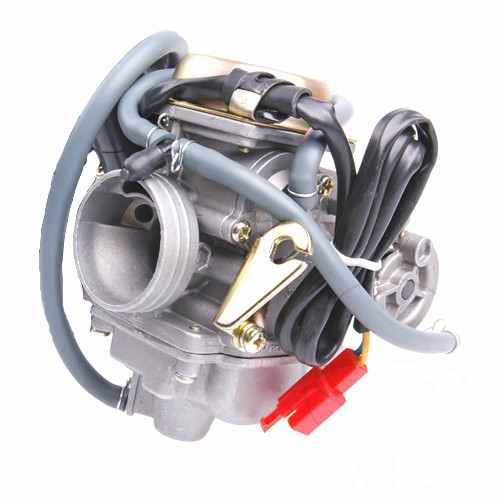 This carburettor is suitable for everyday use and provides performance improvement for 4 stroke engines from 85cc - 180cc. The supplied jetting is for tuned engines for 85cc [51mm]. Carburettor jets for tuning can be selected from the listings in Mike. For installation use the "intake manifold set 24mm" is recommended. The carburettor can be used for 125cc engines as an effective replacement part.